The Bellevue Arts Museum in Washington State is currently presenting “Atoms and Bytes – Redefining Craft in the Digital Age”. This exhibition addresses art, crafts, and design that utilize new technologies and software to create objects. Digital interfaces and equipment once found only in laboratories now are available to a more general public. Most of work on display has been created using tools like computer-aided design, additive layer manufacturing ( 3-D printing), and computer numerical control, which is a process that enables a machine to cut into a solid to create a new shape. There is also work created using constantly updated web based data in the galleries. 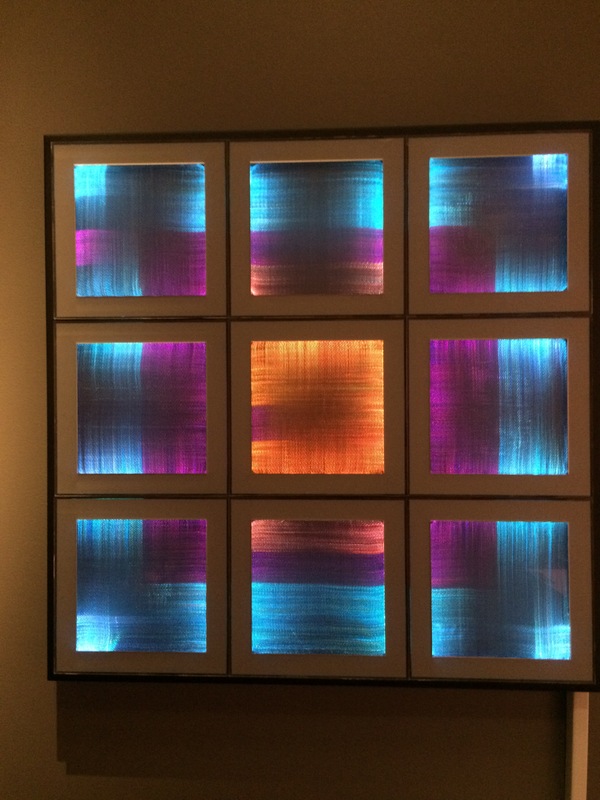 “50 Different Minds (Homage to Josef and Anni Albers)” by LigoranoReese is hand-woven from fiber optic threads. The patterns are determined by software that provides real-time web based data on air traffic at the nine busiest airport in the US. The colors are based on Josef Albers’ color theory and change in response to responses from viewers that use color words in their tweets. LigoranoReese have woven together technology and the sociological implications of this technology to create an deceptively beautiful tapestry. 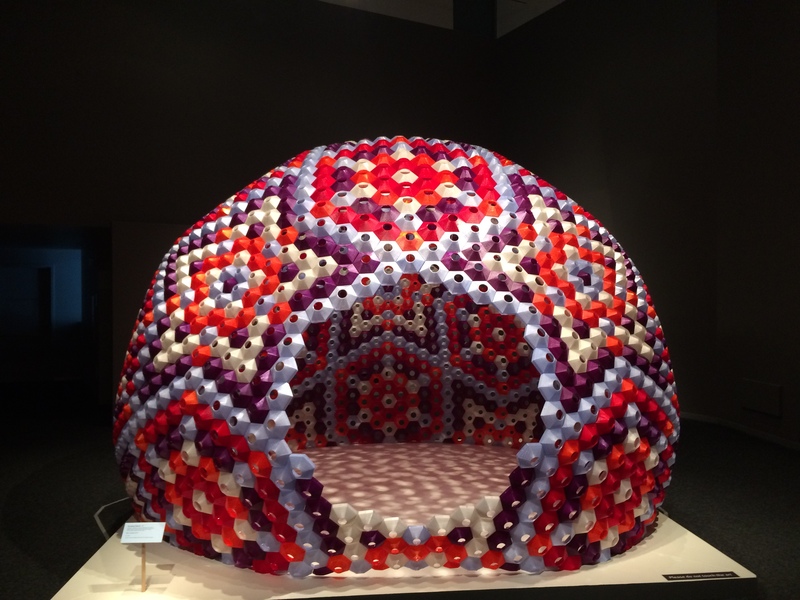 “Emerging Objects”, a design collaborative, uses small PLA plastic elements to build a structure that acts as a room. 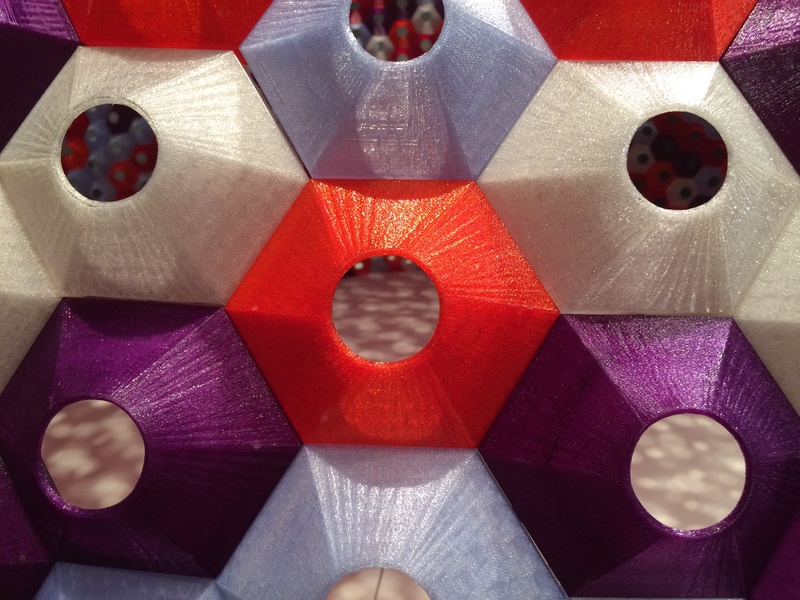 “Star Lounge” is composed of a multitude of PLA plastic hexagons. Some keep their shape as a regular hexagon, some are slightly misshaped to form this large domed igloo like form. 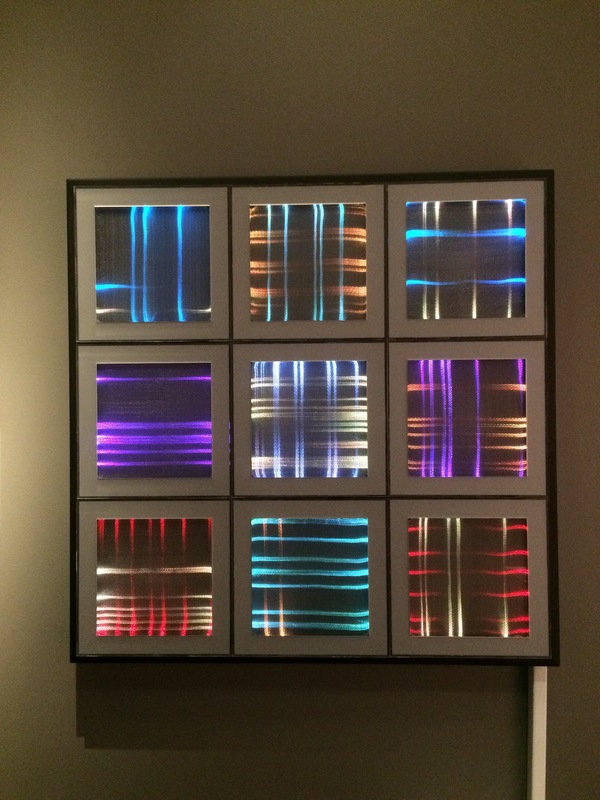 “Atoms and Bytes” presented the a broad selection of work intersecting the boundaries of crafts, design and art. The exhibition approached these objects on two fronts. The technical properties of actual the production were explained with an overview of educational wall texts. Individual signage addressed the cultural inspiration or implications of the items on display. This was one of the most technologically based, well documented, educational shows I have seen. Drawing Then at Dominique Lévy Gallery. There are a number of Upper East Side galleries that display museum caliber exhibitions of historically significant art. The current show at the Dominique Lévy gallery “Drawing Then, Innovation and Influence in American drawings of the Sixties” is an excellent example. 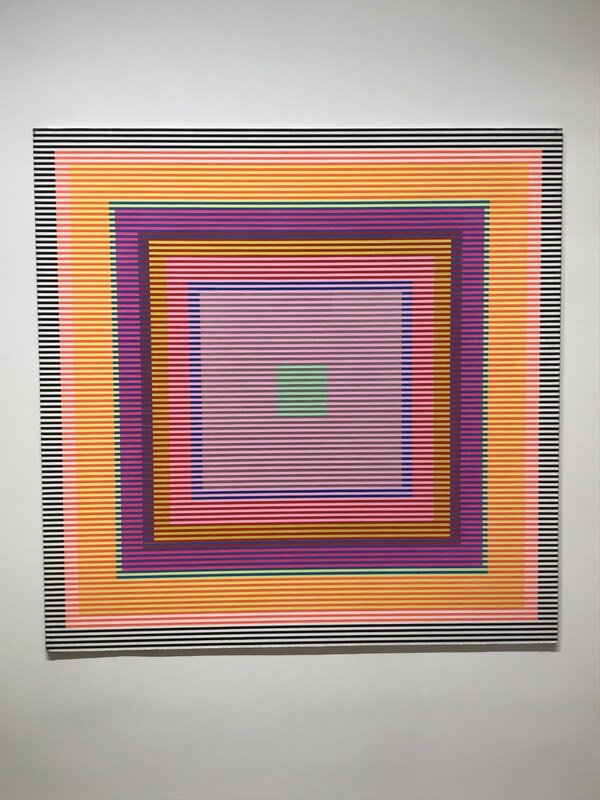 It features work by some of my favorite artists like Eva Hesse, Agnes Martin, and Cy Twombly. 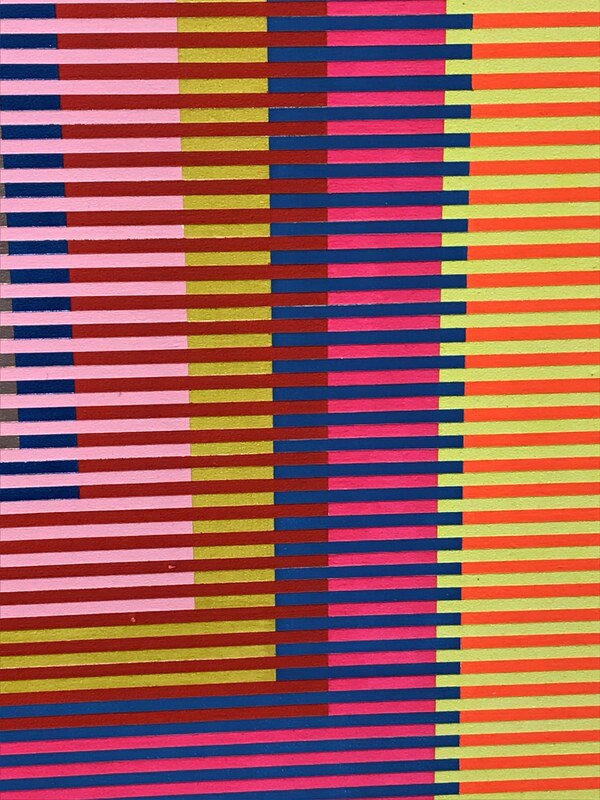 The list goes on and on, there is even a Sol Lewitt wall drawing. 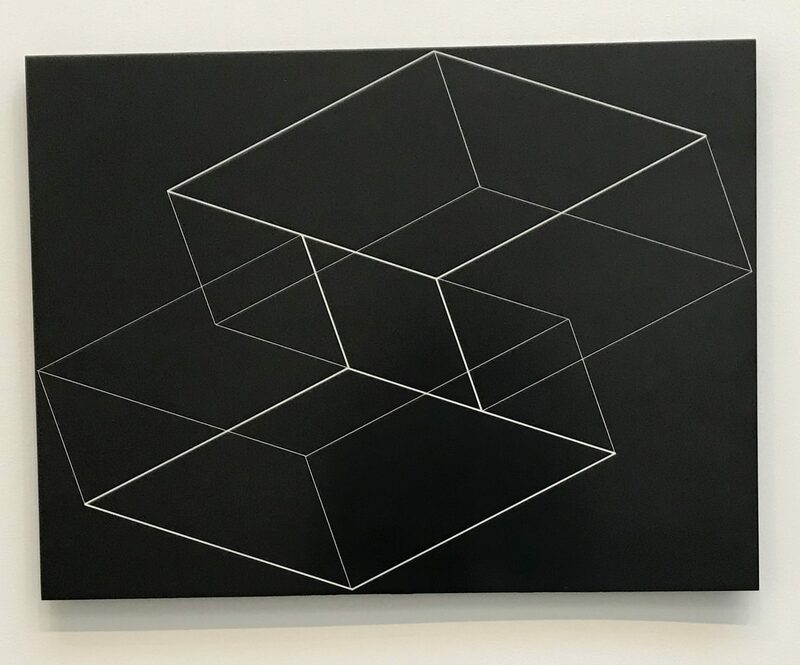 There are two works on display that relate the most directly to Mathematics. 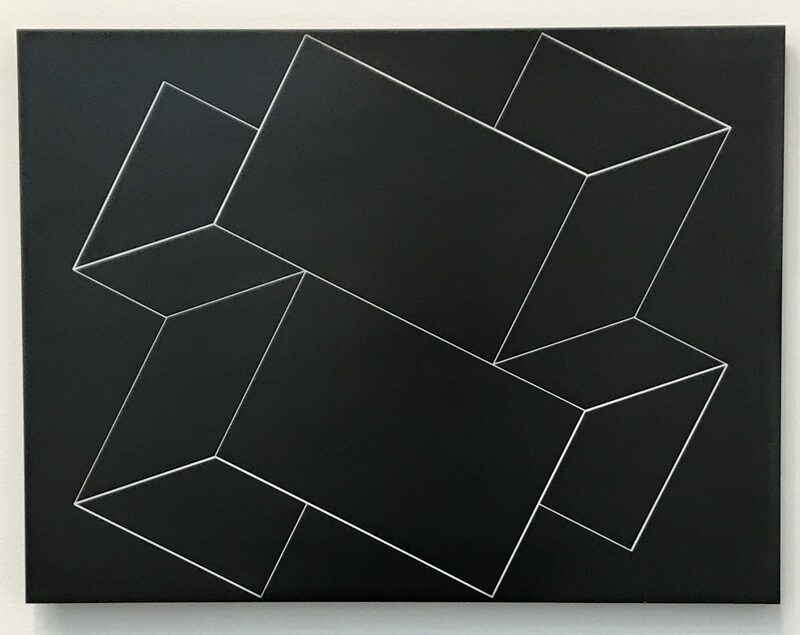 Mel Bochner’s “3” from 1966, is an homage to a Sierpinski Triangle. An equilateral triangular grid formation has been strategically filled in with hand written number 3’s and words that begin with letters “Tri”. The positive and negative shapes created delineate the fractal construction of a Sierpinski Triangle. 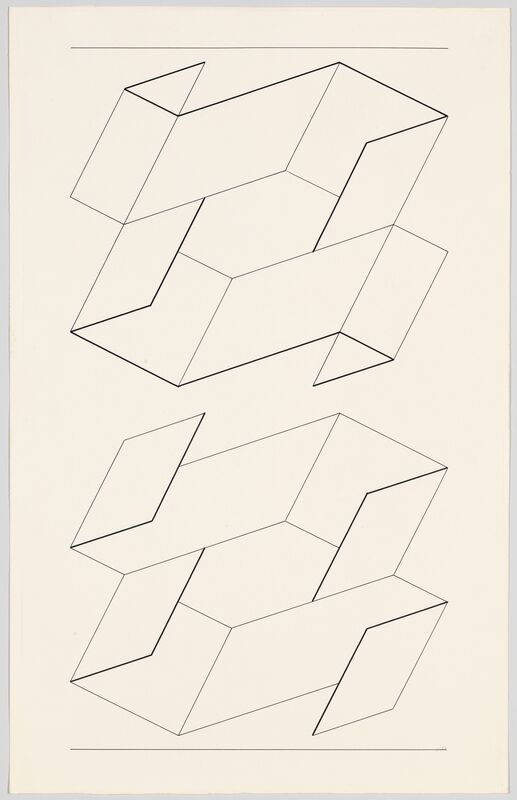 The second drawing is Josef Albers’ “Reverse + Obverse” from 1962. This line drawing is a 2-D rendering of 3-D constructions. Both the top and bottom pairs of the figures employ a 180 degree rotation, an order-2 rotational symmetry. This work is a geometric expression of a form turning through space. This year is the 40th anniversary of the MOMA’s ground breaking 1976 exhibition, “Drawing Now”. The current show at Dominique Lévy gallery is true to this historical reference, focusing on work from the turbulent years from 1960-1969. There is a wide range of work on display from drawings with social commentary, to drawings exploring the aesthetics of minimalism and conceptual rule-based art.